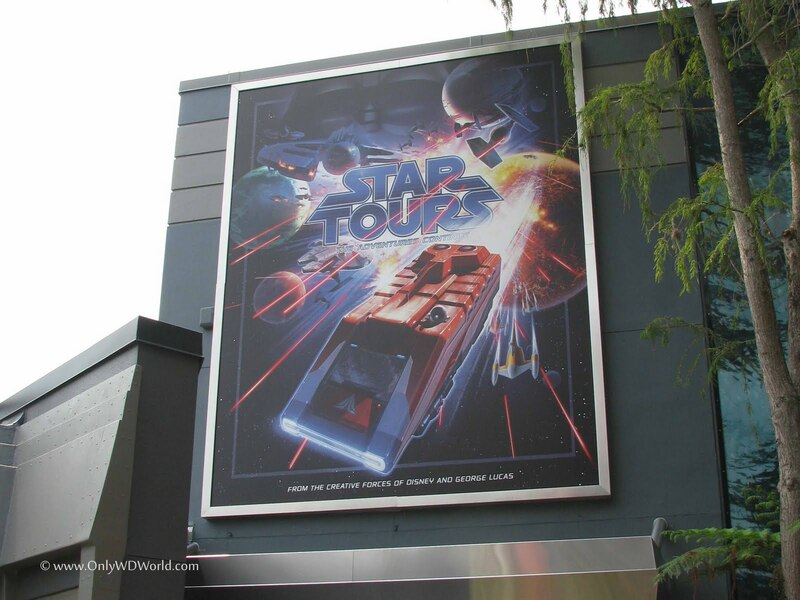 Star Tours - The Adventures Continue is the much anticipated upgrade to the 20 year old Star Tours Attraction at Disney's Hollywood Studios. 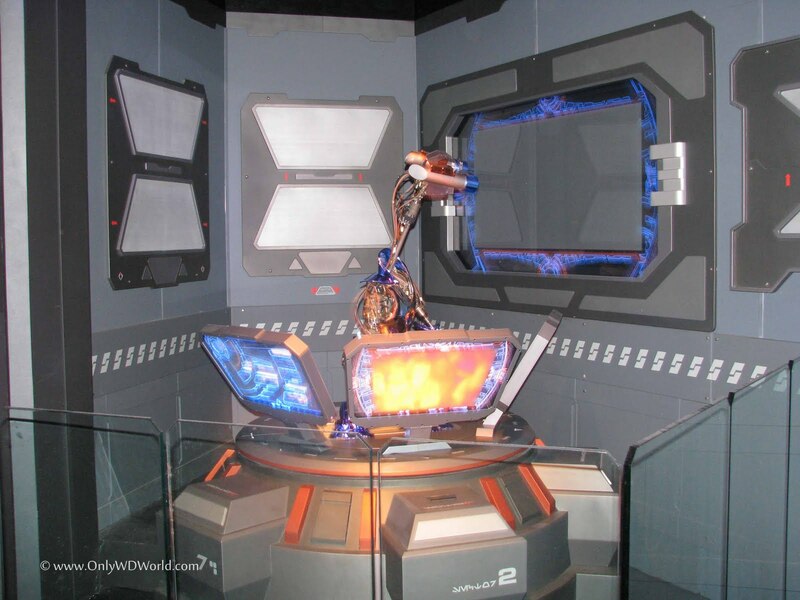 This collaboration between Lucasfilm (including George Lucas himself), the creators of the Star Wars Movies and the Disney Imagineers delivers an amazing attraction for fans of all ages. 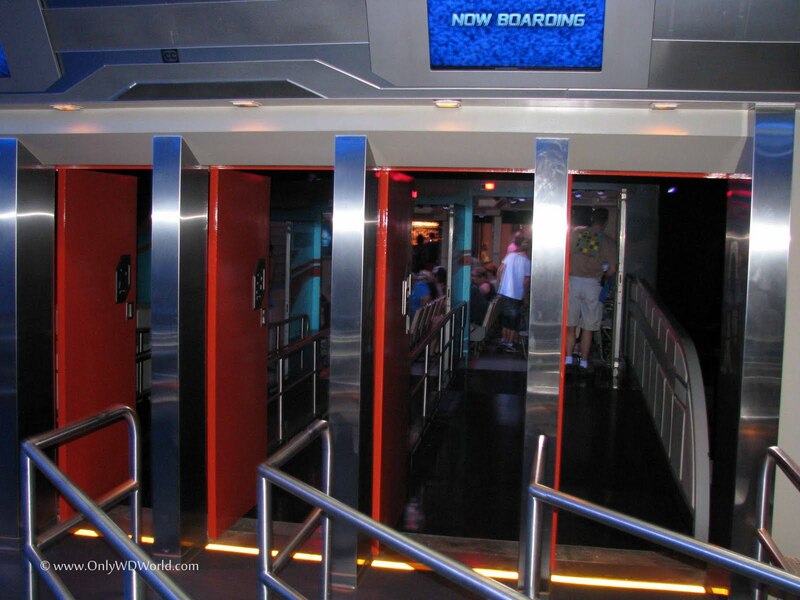 Star Tours originally opened at the then MGM Studios in 1989. It operated for over 20 years until September of 2010 before the major overhaul took place. The changes to the ride itself are amazing and any Star Tours and/or Star Wars Fan is certain to enjoy it. 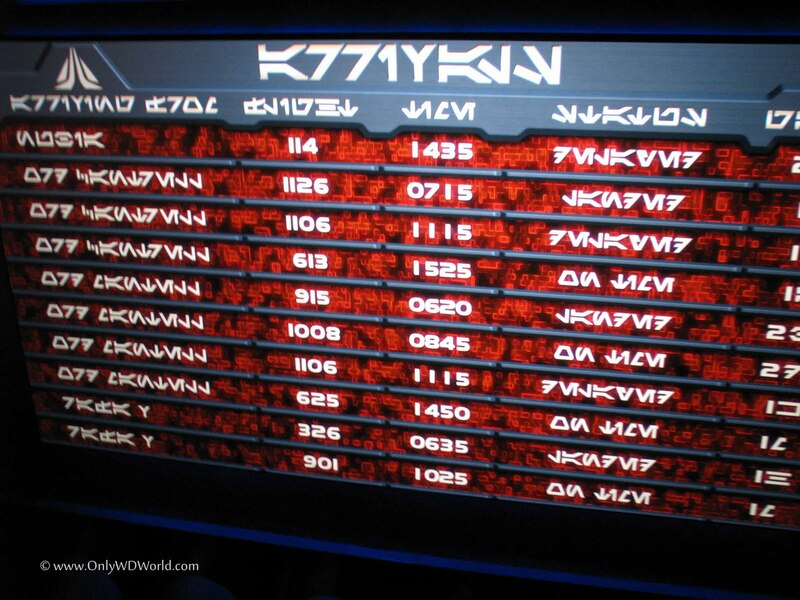 They have added an element of variation to the ride with a total of 54 different combinations of scenes that you may enjoy including scenes on 6 different settings that will be familiar to Star Wars fans. You randomly visit two of those setting plus enjoy one of 3 different openings and one of 3 different closing scenes. The physical changes start from the outside. The signage as depicted above has changed to reflect the added "The Adventures Continue" to the name. 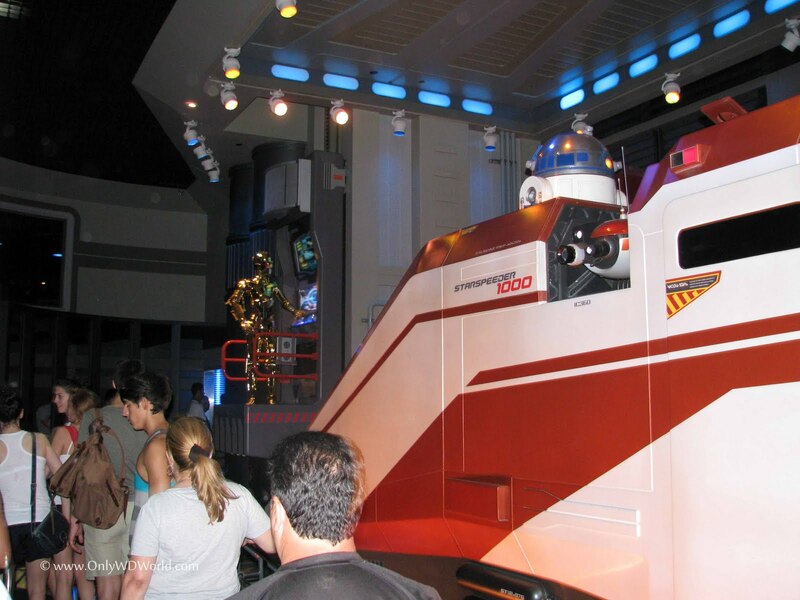 Once you enter the show building you will see the familiar Starspeeder with R2D2, but upon closer inspection this starspeeder is now the Starspeeder 1000 model instead of the original Starspeeder 3000. This change was made to reflect the fact that this storyline actually takes place earlier than that of the previous version of the attraction. You will also notice that C-3PO is entirely gold colored, instead of the mixed version that was previously there. 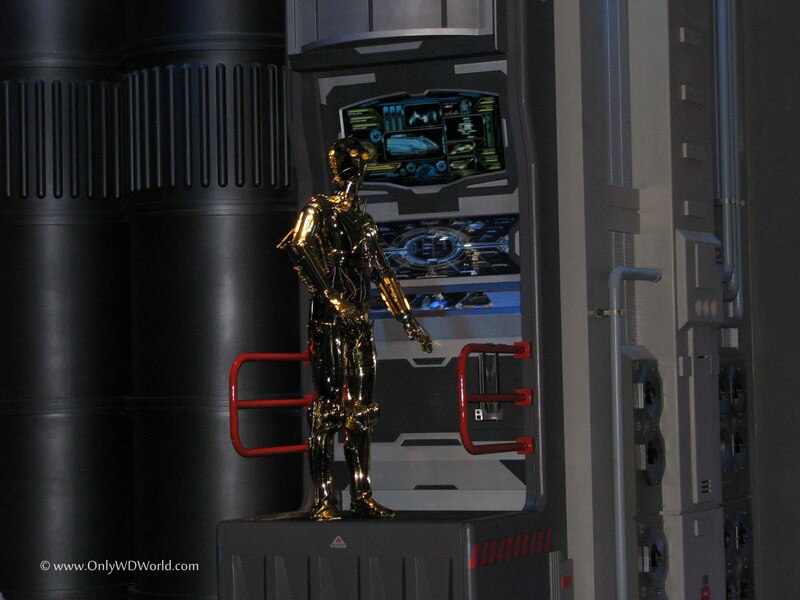 You will also find out that C-3PO along with many of your favorite Star Wars characters now make a much more prominent appearance in the attraction. 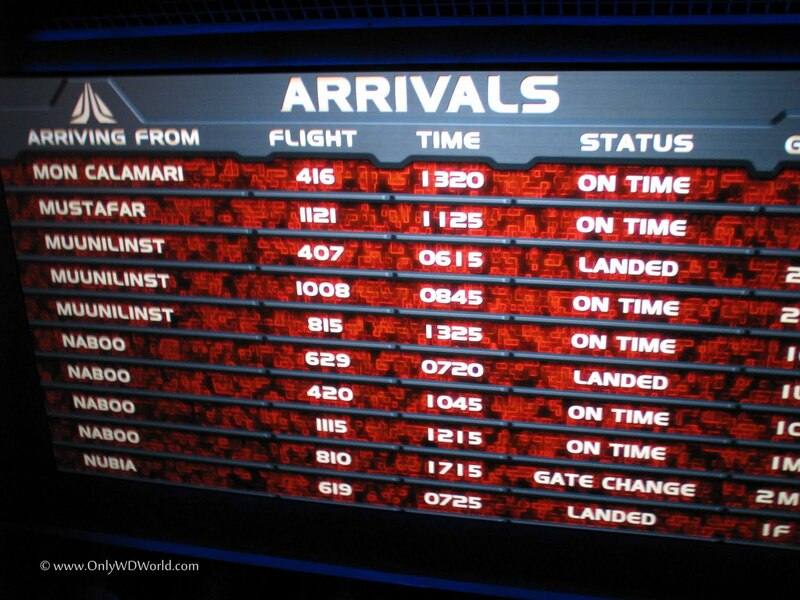 In the main room with the Starspeeder 1000 there is a large video screen that was continually showing interesting information like this Flight Arrival Screen shown in multiple languages (above and below). 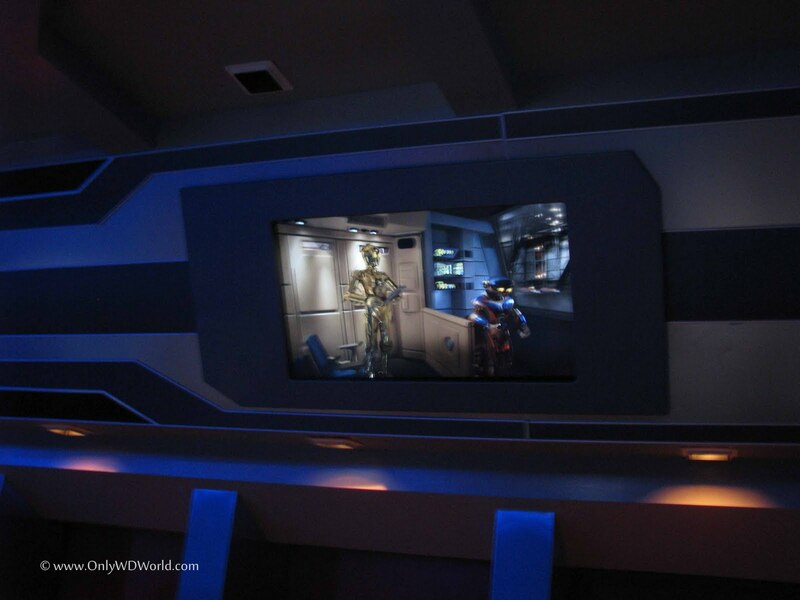 They also showed short video clips depicting the various places that your Star Tours Flight might take you to. Off to the side as you get closer to the attraction entry area you will find an RX-24 (Rex) model droid with a "Defective - Return To Factory" label on it. 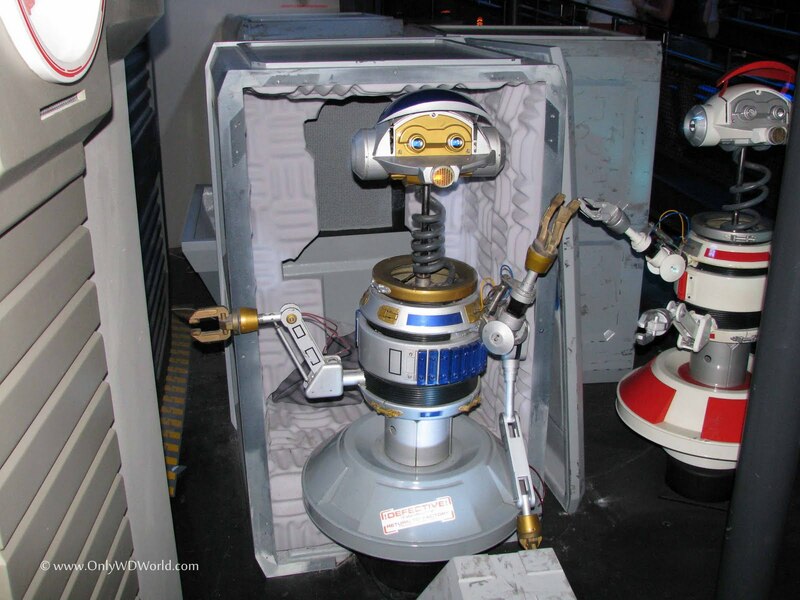 Star Tours Fans will recognize Rex as their pilot in the original version of the attraction. 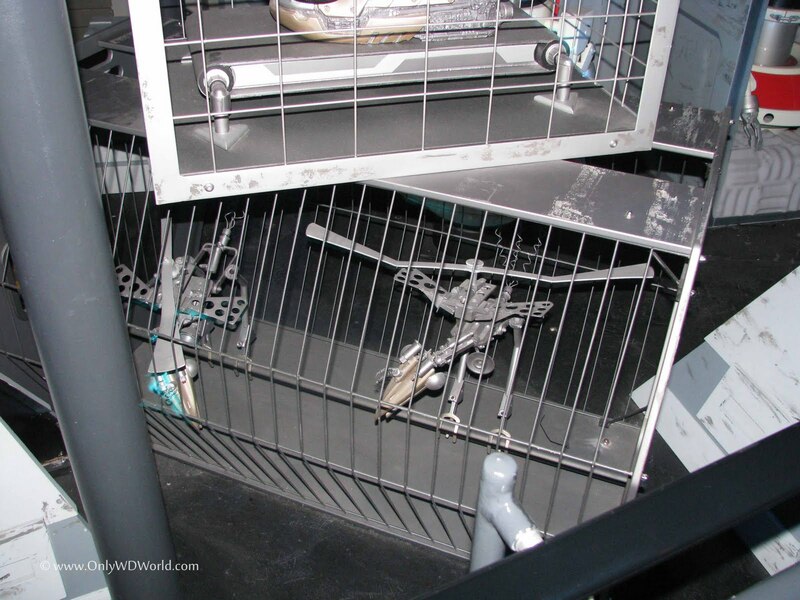 Fans of the original Star Tours will also recognize these bird-like droids from the original attraction queue, although now they are kept in cages in order to keep them out of trouble. As to be expected the detail is amazing in the attraction queue. 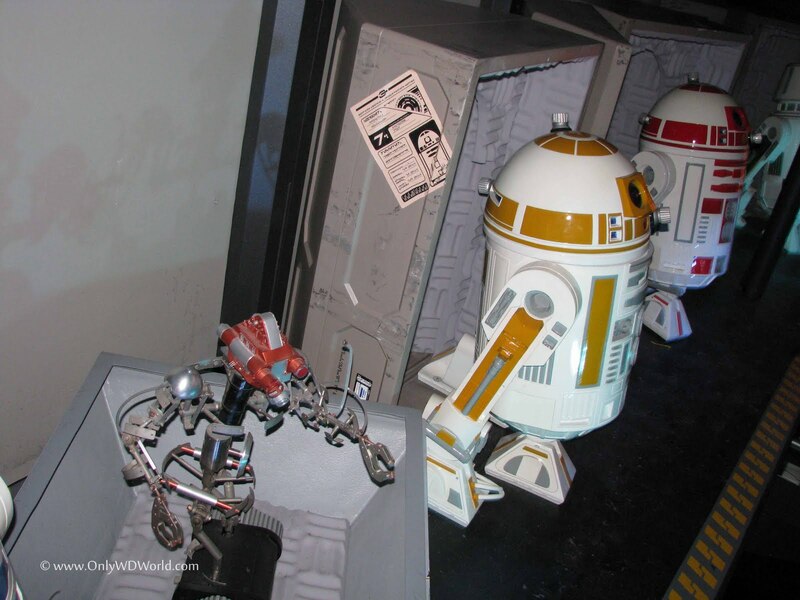 Above is a picture of more droids that you may notice while you are moving through the line. The droid pictured above is working at a security station that is scanning luggage with humorous results. Definitely worth checking out. As you reach the top of the ramp just before being assigned to your Starspeeder 1000 you will encounter this chatty droid. 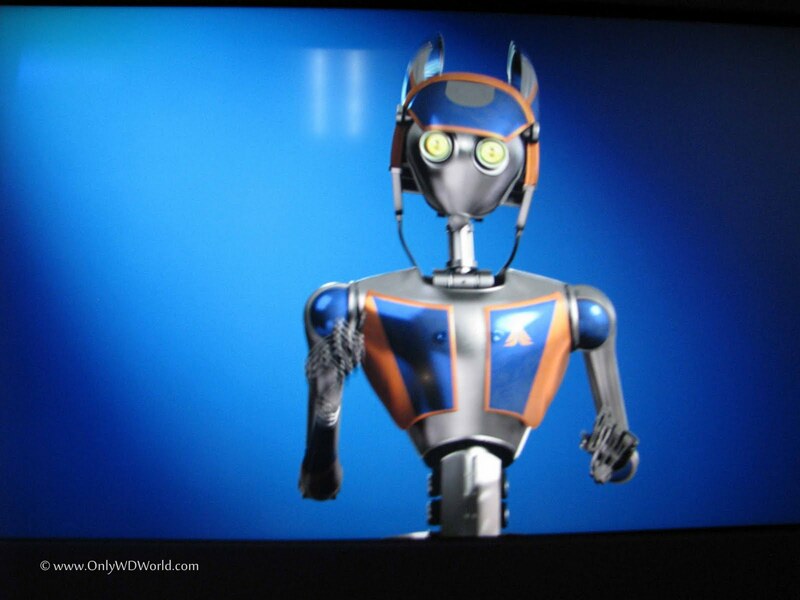 Aly San San is the spokesbot for Star Tours and she gives you the briefing during the pre-boarding video. These maintenance robots provide some humor during the pre-boarding video. Also during the pre-boarding video you see how C-3PO ends up aboard the Starspeeder 1000 instead of the droid who is supposed to pilot the craft. Finally it is time to board the Starspeeder 1000 to enjoy the flight. 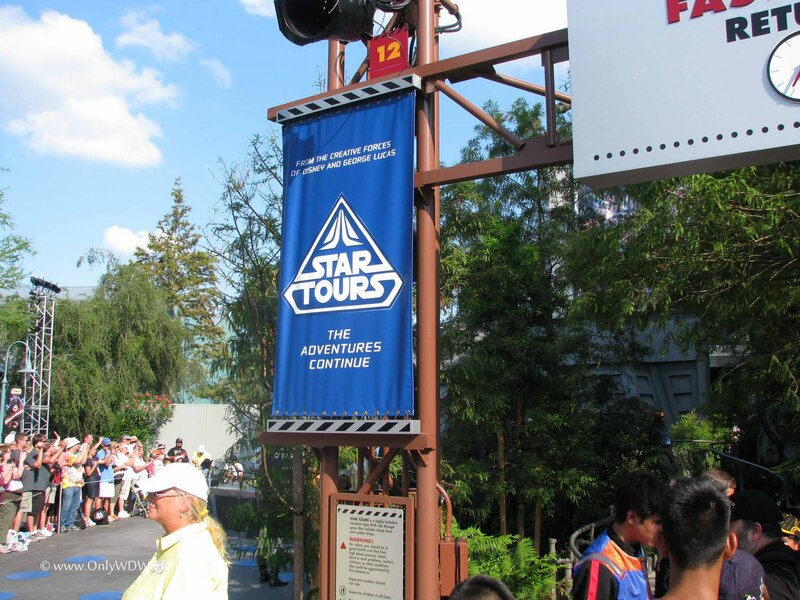 Star Tours - The Adventures Continue is one of those rare cases where the sequel is better than the original. 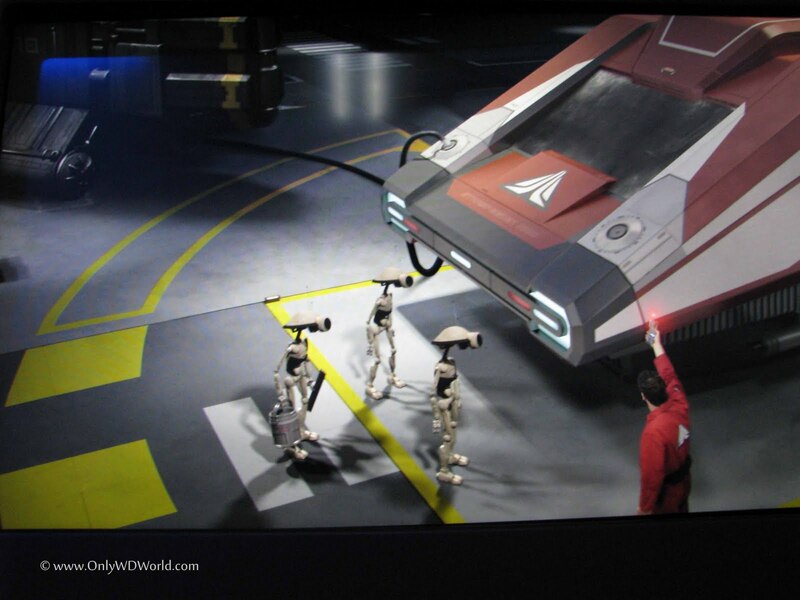 The collaboration that took place between the Disney Imagineers and George Lucas and his Lucasfilm crew did an amazing job of updating the attraction and bringing more "true" Star Wars elements into the attraction. Fans of the original attraction will be pleased with the tributes to the original. New fans will be impressed with the random ride sequences that will cause you to want to come back again and again to see them all. You need to ride a minimum of three times to see all of the elements at least once and most likely it will take more than that to see them all. The upgraded sound and video along with adding the element of 3-D makes the simulated journey even more realistic. Lastly, they added the element of "The Rebel Spy", where one of the passengers in the Starspeeder 1000 is singled out to be "The Rebel Spy." Great idea, and another way to keep the ride interesting and fun for Disney World Guests. We expected a lot and our expectations were surpassed. That doesn't happen too often, but Disney did this one right and deserve credit. 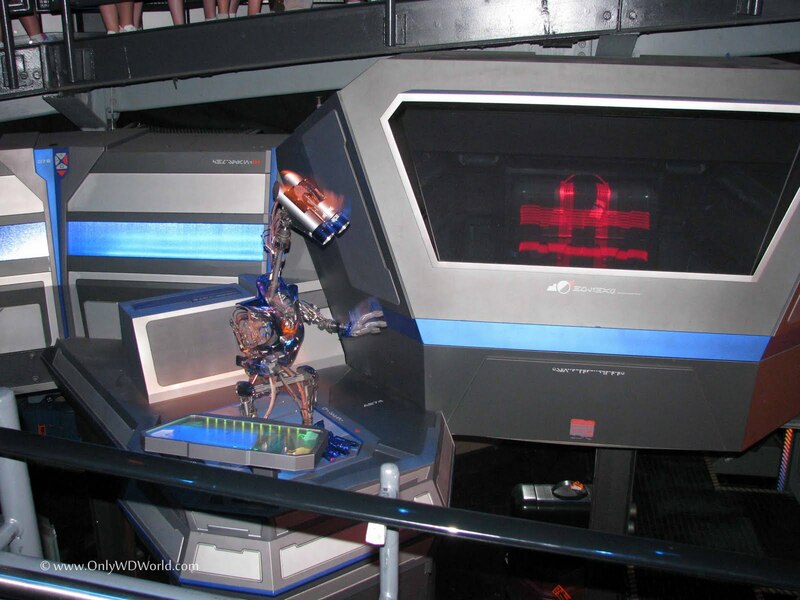 Star Tours - The Adventures Continue is an absolute must for your next Disney World Vacation! 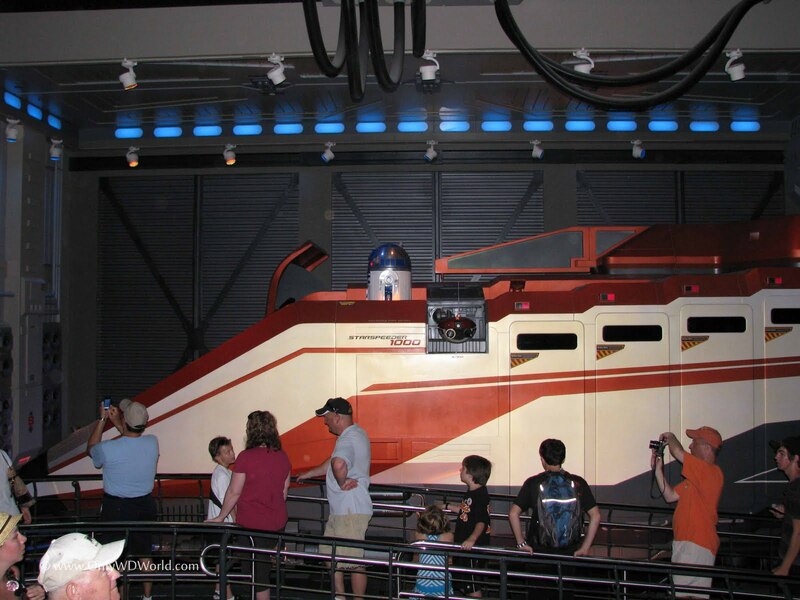 0 comments to "Star Tours - The Adventures Continue At Disney World"